Statesville, NC – Going above and beyond is part of who Keisha Brown is as a person. A mother, wife and nurse, Keisha is used to helping others in any way she can, including assisting her patients and their families in times of need. As the Assistant Director of 4 North and Infusion Care Services for Iredell Health System, Keisha sees needs arise regularly that many not in her shoes would never know existed. That’s why when she recently learned a patient could no longer care for their dog, she didn’t hesitate to step up. In mid-August Keisha was helping to take care of a patient at Iredell Memorial Hospital with a declining medical condition. 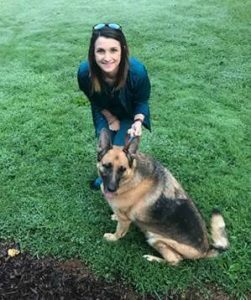 The patient’s husband, Jack*, was also ill, and the married couple of 21 years were the parents of a 4 year old German Shephard named Chloe they have raised since she was 6 weeks old. But Keisha soon learned the couple had no family in the area, and Jack was struggling to care for their dog because of his own medical condition. She knew she had to help. Keisha learned that due to Jack’s health conditions, he didn’t have the ability to brush, walk or exercise Chloe the way he wanted to. In fact, Jack says he was only able to let Chloe outside four to six times a day and pray that she would return. She always did, but after six days, he knew something had to change. “I was so worn out trying to keep up,” Jack said. That’s when Keisha stepped in. Keisha brought her children and husband to Jack’s house to meet Chloe the day after she made her first visit. Despite already owning several other animals, they didn’t hesitate to add another dog to their family. They packed Chloe’s belongings and took her home. “We love her,” Keisha said. But the story doesn’t end there. When Jack called Keisha to check on Chloe, he was in for another surprise. For Jack, it all leads back to divine providence. Keisha agrees. “You don’t bust a watch, throw it in the air, and have it come back down put back together,” Jack said. As for Chloe, Jack is confident he made the right choice and will be forever grateful for Keisha’s willingness to show his family compassion in his time of need. “Chloe’s future is bright,” he said. Iredell Health System includes Iredell Memorial Hospital; Iredell Home Health; Iredell Wound Care & Hyperbaric Center; Community and Corporate Wellness; Occupational Medicine; and the Iredell Physician Network. Iredell Memorial Hospital is the largest and only non-profit hospital in Iredell County. The comprehensive healthcare facility has 247-beds; more than 1,500 employees; and has 260 physicians representing various specialties. Centers of excellence include Women’s and Children’s; Cardiovascular; Cancer; Surgical Services and Wellness & Prevention. Iredell Memorial was also recently named as a Blue Distinction Center+ for Hips and Knees, as well as Maternity Care, by Blue Cross Blue Shield. The mission of Iredell Health System is to inspire wellbeing. For a comprehensive list of services and programs, visit www.iredellhealth.org.